Finland's Social Democratic Party leader Antti Rinne with his wife Heta Ravolainen-Rinne, right, at the parliamentary election party in Helsinki, yesterday. The party is ahead by a thin 17.7 percent margin in elections. 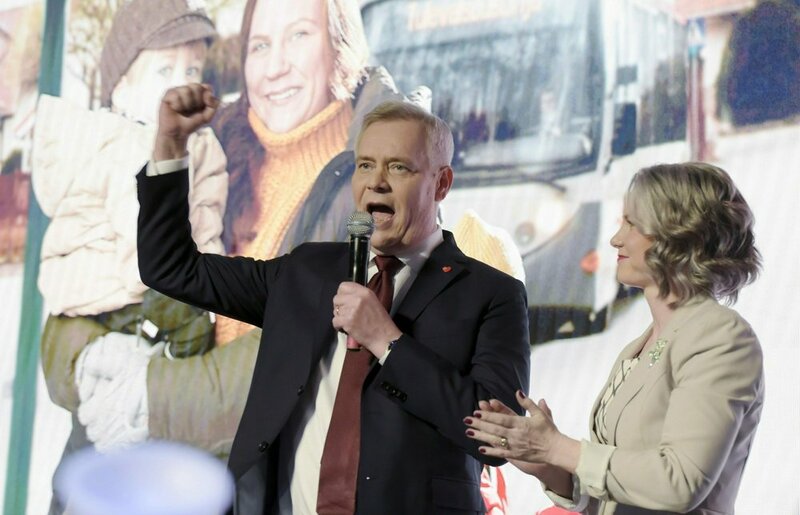 The 17.7 percent of the vote the Social Democrats received gives it 40 of the 200 seats in Finland’s new parliament, one more than the 39 the euroskeptic, anti-immigration Finns Party secured with its 17.5 percent support. The election had been watched for signs of how a bloc of euroskeptic populists might do in next month’s European Parliament elections. The Finns Party is part of an alliance that hopes to become the strongest faction in the European Union legislature and to radically transform EU policies on migration, families and the environment. “For everybody, it’s about the climate. It’s kind of a climate election. Everybody’s feeling some kind of a depression about it,” voter Sofia Frantsi, 27, an interior architect from Helsinki, said. “We want a more moderate and sensible climate policy that does not chase industries away from Finland to countries like China,” Halla-aho said at a Helsinki polling station.